Events can be tested during development to check that they are being received and validate correctly. Events should be tested in your DEV environment and modified if necessary before publishing the event schema to your LIVE environment and publishing a game update. Four QA tools can be accessed from the SETUP section of the navigation menu on your DEV and LIVE environments. Please Note: The QA interface should not be used for load or performance testing. There is a file size limit of 5MB imposed on POSTS to the QA tool, bulk event posts exceeding it the limit will be rejected. 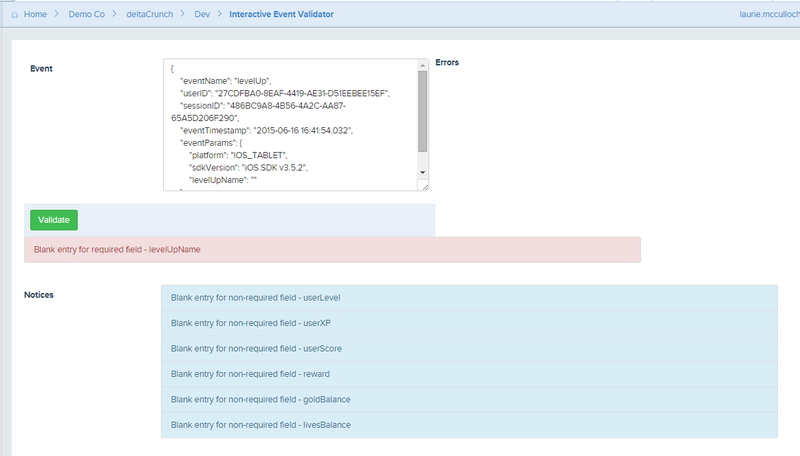 Interactive Validator: Provides an interface to check and validate event JSON. Event Browser : Lets you inspect the last 100 events of each event type that have been stored in either the valid or invalid event stores.You can filter the results in the event browser by event type of userID. This can be very useful if you are playing the game as you can filter for your userID and inspect your events within a couple of minutes of you recording them in the game. Duplicate events occur when the game has not received an OK on sending the events but it has already managed to send the events. It will then retry and the same event will be received twice by collect. Our SDK’s as of version 4.1 will send a unique ID for each event, once we see the same ID twice we will consider the second one invalid. Usually these errors can be ignored and they can therefore also be filtered out in the event browser. The event timestamp outside of valid boundaries error will occur when the eventTimestamp is set by the device and the timestamp is either more than a month in the past or more than 2 days in the future. 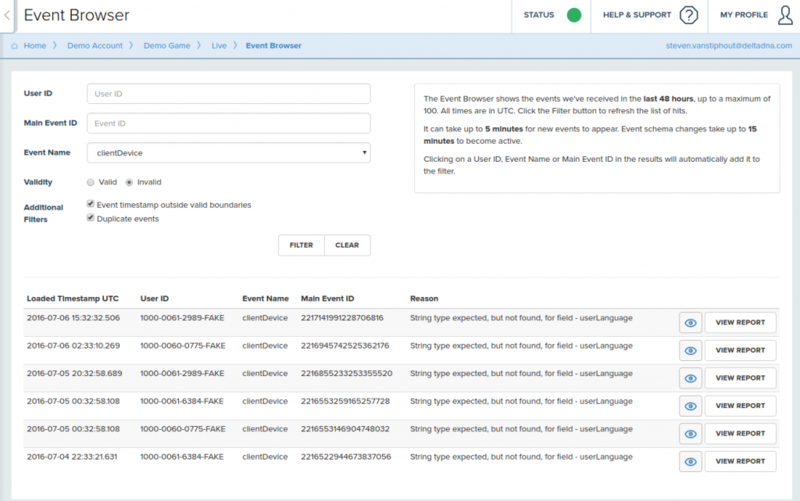 Please Note that the event data inspector shows slightly different things depending on whether you are looking at valid or invalid events.Invalid Events : The raw event JSON will appear exactly as you sent it to deltaDNA so you can see exactly what was sent, alter it and use the Interactive Validator to see what is required to fix it.Valid Events: The event JSON reported shown for valid events shows the event after it has been validated successfully and had any automated parameters injected in to it (e.g. collectInsertedTimestamp, eventLevel, gaUserStartDate etc..). Events containing arrays of objects that are split across multiple rows in the database (generally product objects) will appear as multiple rows, one for the main event and additional ones for each child array object. The Event Diff tool can be very useful for comparing DEV and LIVE events for differences. It can even be used to compare events across different games on your account.